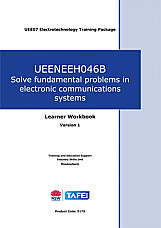 This learner guide covers the determination of the correct operation of communication systems and solving fundamental electronic communications system problems. It includes working safely and problem solving techniques utilising a range of solutions. 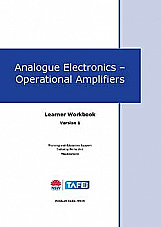 This learner guide covers the use of drawings, diagrams, equipment and cable schedules and manuals as they apply to the various Electrotechnology work functions. 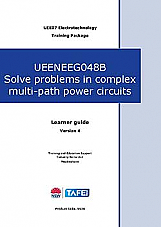 This learner workbook supports achievement of the unit of competency - UEENEEG048B Solve problems in complex multi-path power circuits. This learner workbook supports achievement of the unit of competency – UEENEE E011B Manage risk in electrotechnology activities. It covers risk evaluation, management and mitigation. Direct Current Circuits Learner Workbook Version 1. 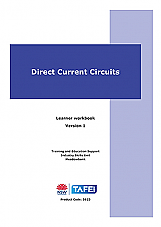 The Direct Current Circuits learner workbook contains learning exercises, review questions and sample assessment instruments. UEENEEJ102A Prepare and connect refrigerant tubing and fittings Learner Workbook Version 1. 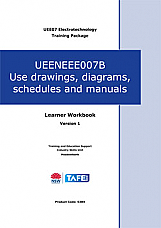 The UEENEEJ102A Prepare and connect refrigerant tubing and fittings learner workbook contains learning exercises, review questions and sample assessment instruments. UEENEEJ103A Establish the Basic Operating Conditions of Vapour Compression Systems Learner Workbook Version 1. The UEENEEJ103A Establish the Basic Operating Conditions of Vapour Compression Systems Learner Workbook contains learning exercises, review questions and sample assessment instruments. The UEENEEJ104A Establish the Basic Operating Conditions of Air Conditioning Systems learner workbook contains learning exercises, review questions and sample assessment instruments. UEENEEJ107A Air conditioning and refrigeration systems, major components and associated equipment Learner Workbook Version 1. The UEENEEJ107A Air conditioning and refrigeration systems, major components and associated equipment learner workbook contains learning exercises, review questions and sample assessment instruments.